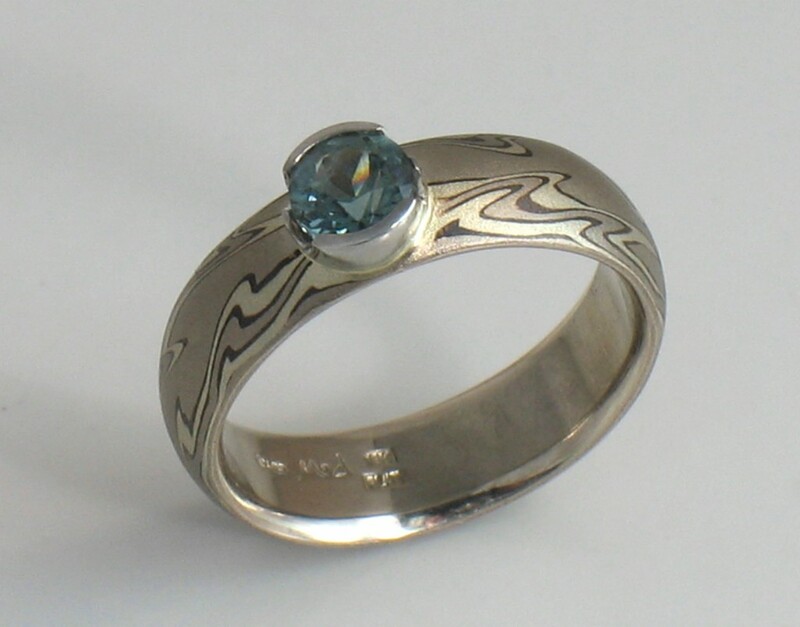 Montana Sapphire in Mokume Gane ring, 14k white gold ring with platinum half bezel, will this fit your finger, your style? A elegant and natural look this Mokume gane ring is perfect for a lady who wants something unique, but simple. Mokume gane translates from the Japanese as wood-grain; it is the art of fusing layer of precious metals to form a single piece with unique markings. This particular piece features the Flame-White Lightning pattern of Mokume which is primarily white gold with a platinum half bezel to hold the sapphire. Since the ring is composed of several different metals each wears at a different rate, thus over time the piece looks even more like well worn wood. Finger size 7. The sapphire is very slightly greenish blue, 0.69 ct., 5mm round.